Here here; well said, Heath. I was a sucker bought one of those $40 sealed copies from SAE! Interesting that FSM has been working on this final title since 2011. - they must have really put alot of care and hard work into this new release. Surely a worthy title for a double-dip. I wish I had my 40 bucks back to spend towards this though, haha. It's a pass for me, but looks like yet another great release for those who are interested ...got a feeling it might not stay on the shelves for long! Once again: Bravo and kudos to Lukas Kendall!!! 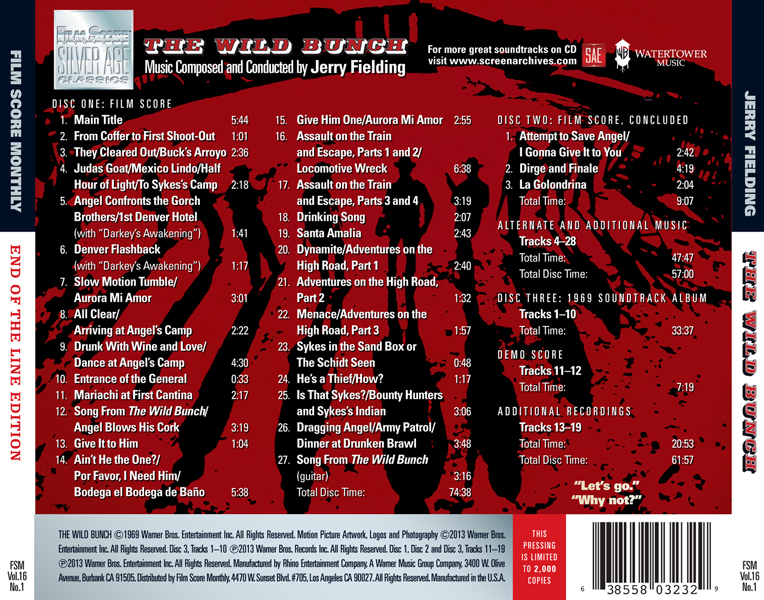 This WILD BUNCH 3-CD Set make my day. This is the greatest symbol for a label. This is Jerry Fielding's top score. It's about damn time! Great score, great run, Lukas. Here's hoping you sell a bunch of them, pun intended. I've ordered mine. So I take it you're hungry for some delicious billy goats? PS: I love this Lenz's "Decorated 035" typeface, Joe. Looking at that back cover, one of the things I'll miss most about the FSM releases is the snippet of dialogue always included from the film. It's a little detail that goes such a long way in setting the tone for each package. Check out the lower-right corner of the back cover. Right. I was saying I'll miss seeing that. Those ended up taking forever to do! Someone would have to pick a good one from the movie, and then we'd want to copyedit it to make sure it was accurately transcribed. Passing on this, but I was one of the 700 that got "Who's Life Is It Anyway" when it was released. I always try to get the typefaces right for the packaging. And since I cut my teeth on typesetting in the pre-PC era, it's actually possible to remember most of the fonts that existed from that era. Now there are so many knockoffs and new cuts, it's a little harder to keep 'em straight. Ordered, but kind of shocked FSM would want to subtitle the release, still it looks decent on the cover. Usually when movies do it it becomes annoying. I still have my old copy that was released by Warner Bros thru that videotape box set. Interesting to see that this is limited to 2000 copies (back cover). I've checked Body Heat & King Kong & there's no limited number printed on those (if so, at 2000 I'm sure they would have sold out a while back). I'd think the price & the fact that a lot of older fans have the old limited edition will stop a fast sell-out, but this being the last FSM, you never know. 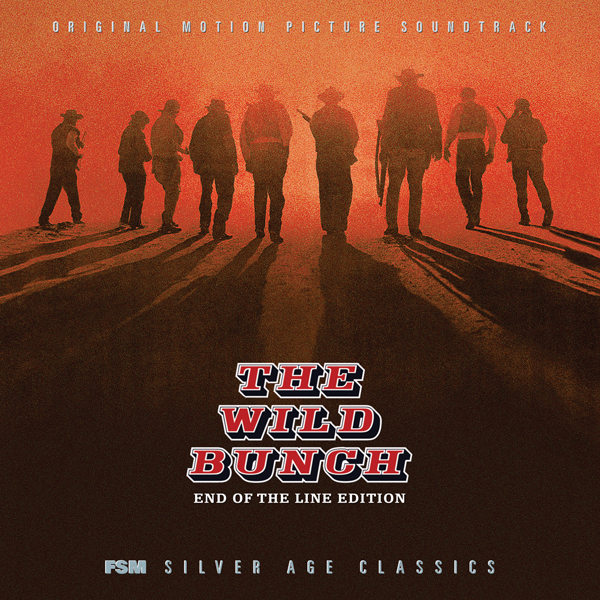 Regarding Wild Bunch, but I wish WB would revisit the film for a new Blu Ray with dts hdma audio. I can almost see them doing a Ultimate Edition BLU set for the movie. I think Bulitt deserves the same treatment. Can't wait to get this 3 Disc CD set.